Company Name Seven Carwash Korea Inc. This steam car washer is an epoch-making and eco-friendly steam car washer by using only 2L of water to wash a car. 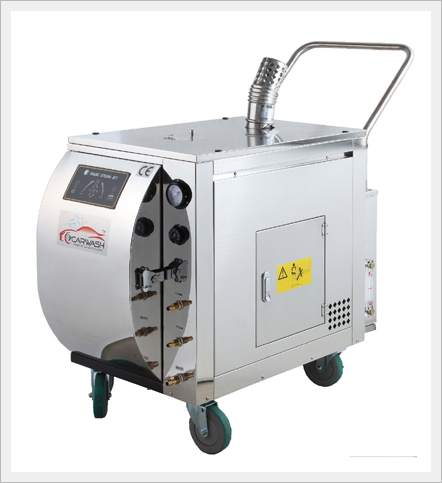 This equipment can clean an interior and exterior of a car engine as well as a house cleaning, a bathroom of a hospital where sterilization is needed. Also, this steam car washer is a forthcoming eco-friendly car washer because this can be used without a wastewater utility and permission. CL 1700 can expand investment enterprise and reduce a portion of expense and will make earnings more than expected from a small amount of investment. This steam car washer can be used without a store because it is movable by using Kerosene and a battery of a car. Places where several cars to be washed once - a car wash, a gas station, a large parking place, agency of rent car, a big market and a large building. Places where car wash is needed without waster water - a car center, a maintenance shop, a car interior shop, a used car market and a showroom of a car. Places where sterilization is needed – a carpet cleaning, a house cleaning, a bed, a sofa, a bathroom, a hospital, and a floor. About Seven Carwash Korea Inc.